Arthur Flournoy Feild, born March 10th, 1856 in Little Rock, AR, was an amatuer baseball player for various Little Rock clubs, most notably the Accidentals. See the Feild Family. Arthur Feild was the second of twelve children born to Silas Flournoy Feild, a Tennessee-born merchant and farmer. Arthur and his older brother Tolly began playing baseball in Little Rock in 1869. Arthur was only 12 when his name was first printed in an Arkansas Gazette boxscore. In 1875, Feild joined the Accidental Base Ball Club. In September of that year, the Accidentals joined the Foul Flag Association, winning the championship. 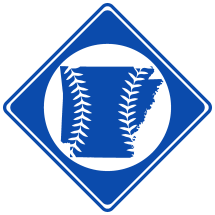 As the best team in Little Rock, the Accidentals decided to test their luck and play the St. Louis Red Stockings in a series of two exhibition games. The Accidentals lost both games, but Arthur and his brother Tolly were offered a chance to play with the Red Stockings professionally. However, it seems they must have refused. Working as a farmer, Feild continued playing baseball in Little Rock until at least 1883. He later married Daisy Helen Hobbs and together they had 3 children. The family lived in California for a time, and Arthur Feild died there on June 23rd, 1892 at only 36.